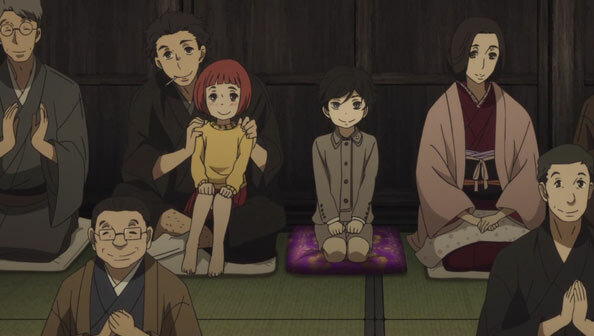 For all the sorrow and tragedy and pain in his life, things turned out pretty well for Yakumo, AKA Bon, and as it turns out, he really did die under ideal circumstances: he died in his sleep, peacefully, painlessly, surrounded by those who loved him, listening to his grandson doing rakugo. This episode, perhaps the finest in the entire run of the show, takes place entirely in the purgatory-like place the recently deceased go before crossing the Sanzu River to the hereafter. This requires a fare, which, big surprise, Sukeroku hasn’t been able to afford yet. The show had always teased an interest in depicting a more fantastical world than that of the living, and in this place people can change their age at will, time is kinda hard to put a finger on. 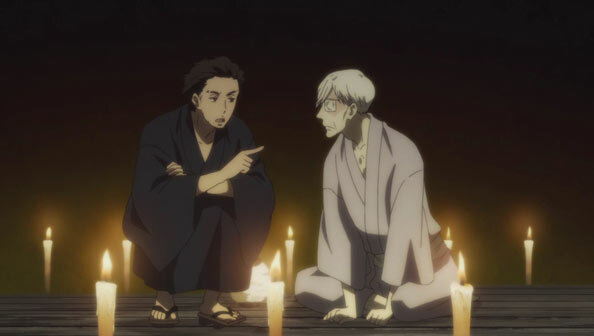 Yakumo is initially annoyed that once again Sukeroku is sponging off him, even after death, but once he’s a boy again, he quickly falls back comfortably into the very deep brotherly bond they shared. The afterlife is suitably lush and otherworldly, but also borrows heavily from traditional Japanese aesthetics, which makes sense considering the characters we’re following. Sukeroku makes sure Yakumo understands how grateful he is for raising Konatsu. The reunions don’t stop with Sukeroku, as Miyokichi died at the same time. While she’s cast away the “role of a woman”, she and Sukeroku are still a married couple, working together to earn fare across the river. It feels like, from their perspective, they only recently got here, just like Yakumo. Yakumo wanted more than anything to apologize to Miyokichi for dumping her so heartlessly, but she holds no grudges in this place. In fact, she can now reflect on the mistakes she made in life, namely latching onto one person rather than rely on, and be there for, others. She’s also amused to no end by Yakumo talking like an old man, since he died as one. The three travel together for a bit along that seemingly endless scaffolding, and Yakumo mentions the food is tasteless and unsatisfying. 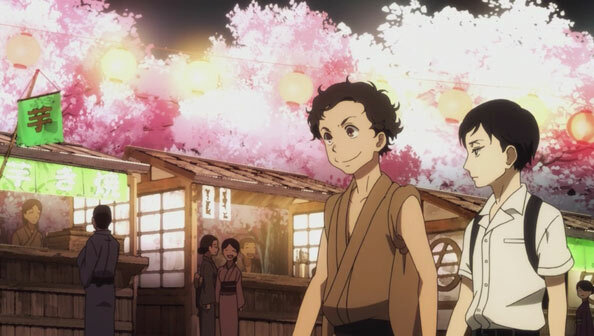 Sukeroku says it’s because they’re dead, but if he wants to be satisfied, he knows just the place: the very theater that burned down two episodes ago has arrived in the afterlife as well. It had a soul, after all. Even better: it’s a packed house with the biggest billing ever: All the masters of all generations…and Yakumo is on the bottom. He’s gone from grizzled old master to fresh new arrival in this place. Sukeroku decides to warm the place up with a performance that really does seem to give flavor to the sake, meat, and onions he pretend-drinks and eats (never has his jaunty entrance theme, which Yotaro inherited, sounded better or more significant). “You can’t take this taste with you when you die!” also has new meaning. He’s still got it, in this place, which has gone back to exactly the same as it was in the old days. There’s also a magic cushion (I’ll allow it) which brings the person from the living world the performer wants to listen the most. 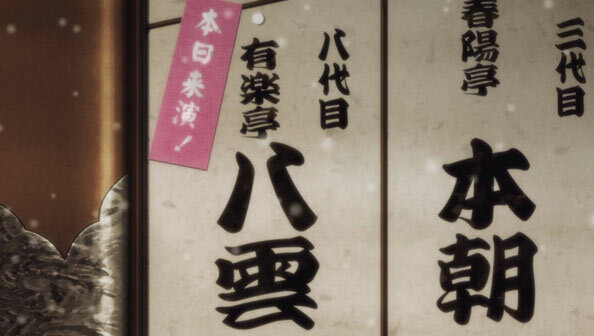 In Sukeroku’s case, it’s his daughter Konatsu, who appears the age she was when he and Miyokichi died. 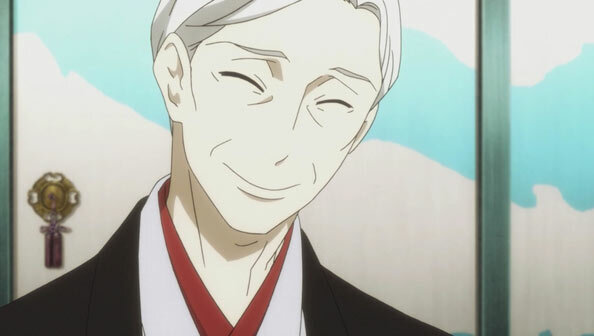 For Yakumo, it’s his grandson Shin, about the same age as his mom, and just as enthusiastic to hear Yakumo’s rakugo. Yakumo takes the stage as his old self, but has never looked happier, beaming at his reunited family and full of energy. In a playful mood, he performs “Jugemu”, and Miyokichi and Shin “sing” along the comically long name. His story continues as the camera leaves the old, drafty, but brightly glowing theater, which slowly fades out of focus. Yakumo then finds himself in a fine boat, packed and ready for his journey across the Sanzu. 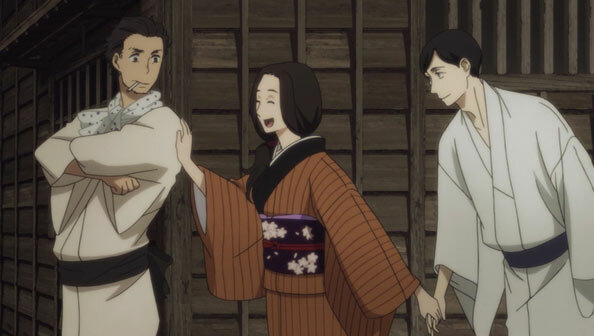 Sukeroku sees him off, and Yakumo makes him promise he and Miyokichi will join him soon, once they save up enough for their fare (the one thing he apparently can’t share with his friends, even if he wanted to). That could be a year from now, or it could be yesterday. While en route, the ferryman reveals himself as Matsuda, who may have followed his master into death after nodding off himself, and he couldn’t be happier to be by his side again, chaffeuring him to the very gates of heaven. 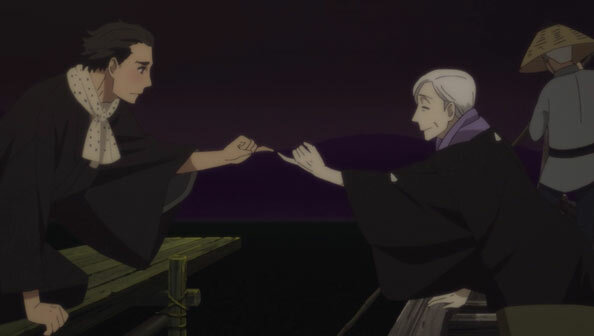 It’s a fitting end to Yakumo’s story, and a achingly gorgeous episode full of joyful and tear-jerking moments, from Miyokichi first seeing Yakumo, to Konatsu hugging her mother, to Yakumo taking the stage one last time and meeting Matsuda on the boat. 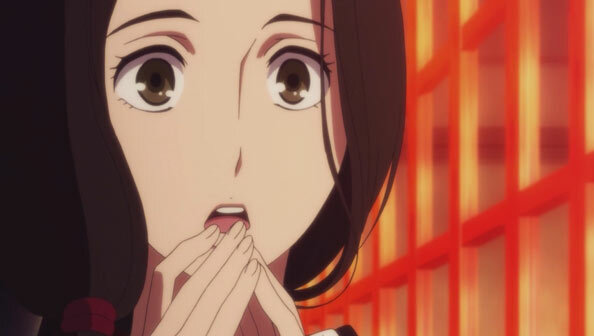 The preview indicates the last episode will be an epilogue that jumps forward in time, perhaps to an older Shinnosuke with a red-haired young woman who may be his younger sister. That should be fun, even if it doesn’t come close to approaching the greatness of this, Yakumo’s farewell.